Background: Chikungunya infection flare-ups have manifested in nations of Africa, Asia, and Europe including Indian and Pacific seas. It causes fever and different side effects include muscle torment, migraine, sickness, exhaustion and rash. It has turned into another, startling general medical issue in numerous tropical African and Asian countries and is presently being viewed as a genuine risk. No antiviral treatment or vaccine is yet available for this ailment. The current treatment is centered just on mitigating its side effects. 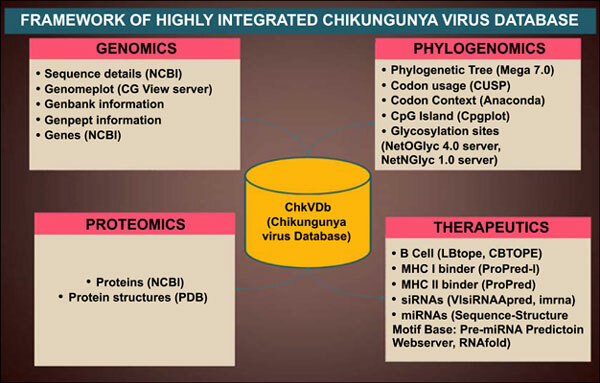 Objective: The objective was to encourage the study on this viral pathogen, by the development of a database dedicated to Chikungunya Virus, that annotates and unifies the related data from various resources. Method: It undertook a consolidated approach for Chikungunya Virus genomic, proteomic, phylogenetics and therapeutic learning, involving the entire genome sequences and their annotation utilizing different in silico tools. Annotation included the information for CpG Island, usage bias, codon context and phylogenetic analysis at both the genome and proteome levels. Results: This database incorporates information of 41 strains of virus causing Chikungunya infection that can be accessed conveniently as well as downloaded effortlessly. Therapeutics section of this database contains data about B and T cell Epitopes, siRNAs and miRNAs that can be used as potential therapeutic targets. Conclusion: This database can be explored by specialists and established researchers around the world to assist their research on this non-treatable virus. It is a public database available from “www.chkv.in”. Keywords: ChkVDb, CpG Island, codon context, phylogenetics, glycosylation sites, Epitopes, siRNAs, miRNAs. Keywords:ChkVDb, CpG Island, codon context, phylogenetics, glycosylation sites, Epitopes, siRNAs, miRNAs.